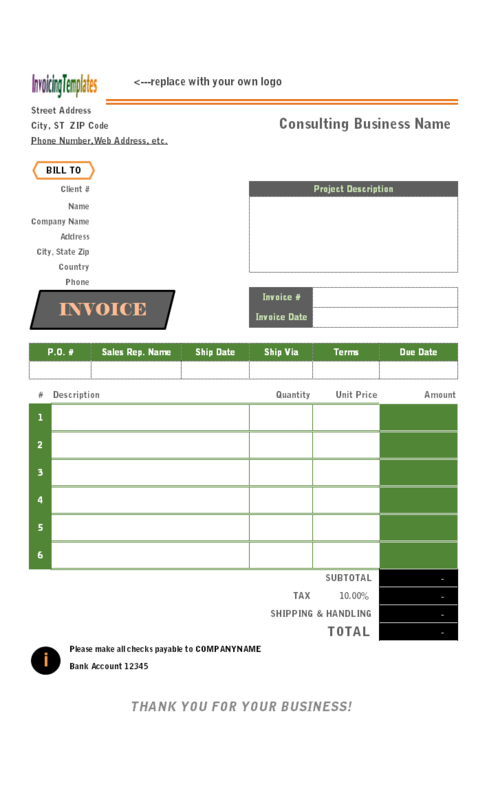 This bill form for environmental consulting companies / firms is a service invoice template. 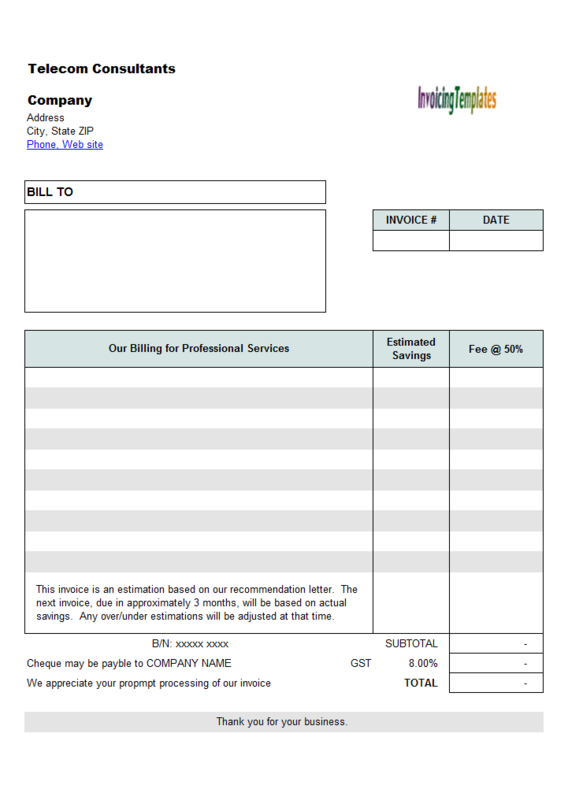 It features an "Attention" section near the "Bill To" section, and also a custom field for showing "Previous Balance" on current invoice. 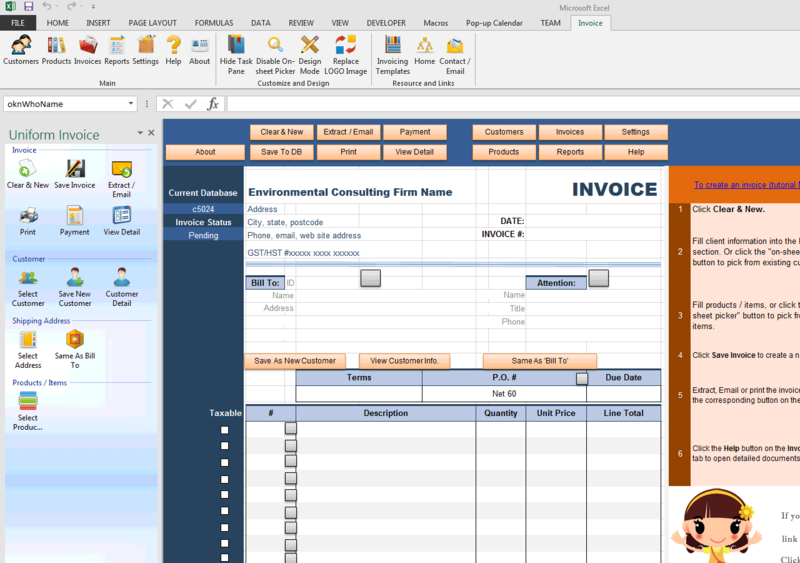 c5024 now includes the customized invoice template for the latest version of Invoice Manager for Excel. This is what you will see when you open environmental-consulting.xlsx. 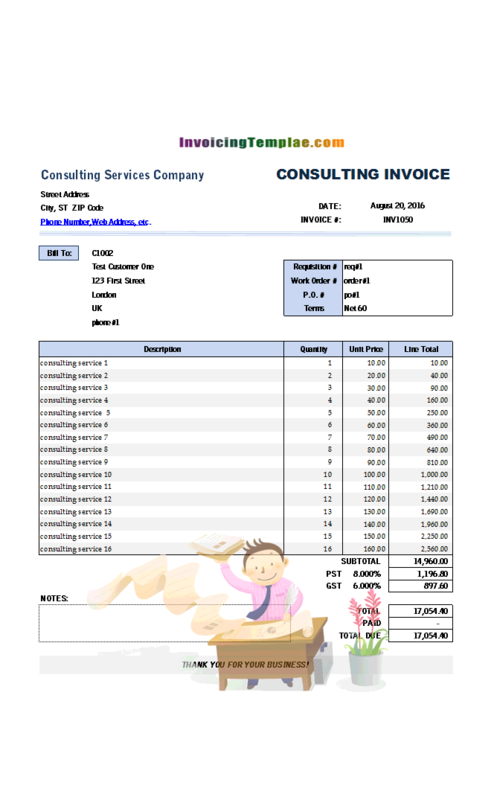 Although named with "Environmental Consulting" in its title, it could be used by many consultants or freelancers for billing the consulting service they've rendered. 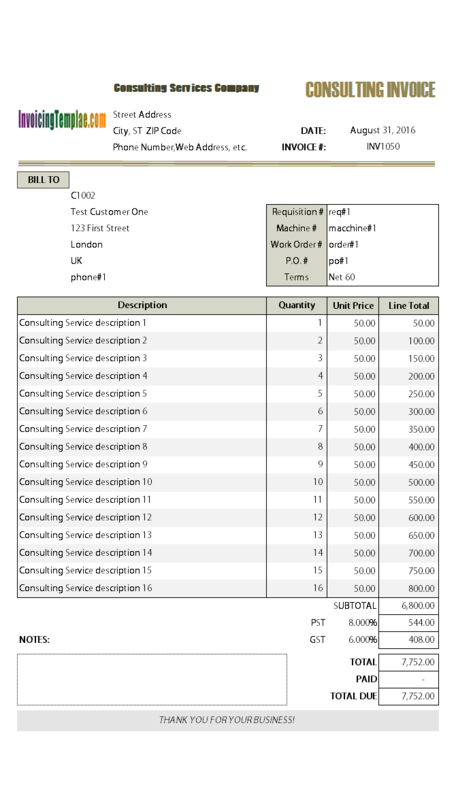 It could even be used for hourly-rate billing if you modify the "Quantity" and "Unit Price" column headings to "Hours" and "Hourly Rate". 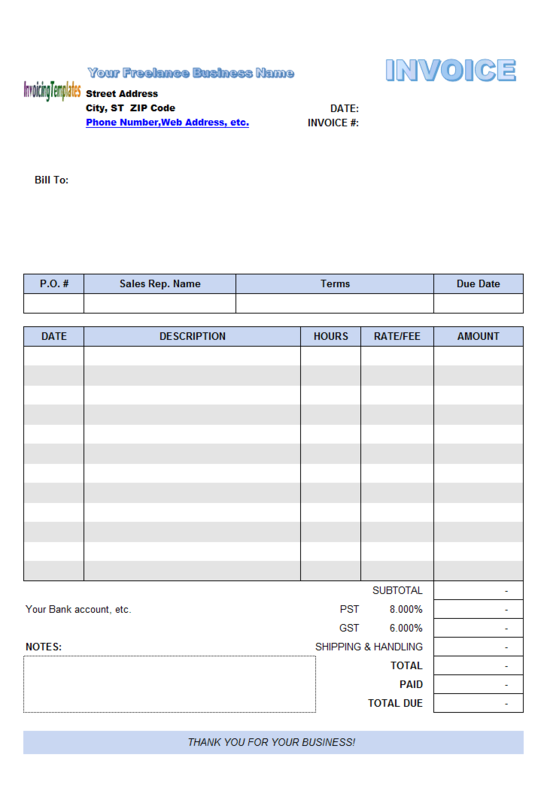 The default rate on this template was named HST, and there are also space for you to fill in your company's GST/HST numbers on the top of the spreadsheet. 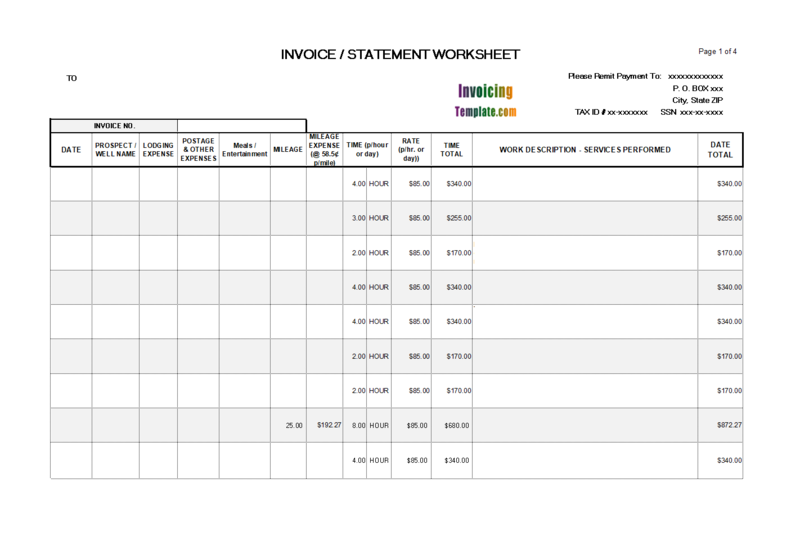 If you need to rename the tax, for Invoice Manager for Excel (namely Uniform Invoice Software) users it is recommended to do this by using the "Settings" window -- first, you click the "Settings" button on the "Invoice" ribbon tab to open the "Settings" dialog box, and then click the "Taxes" tab. 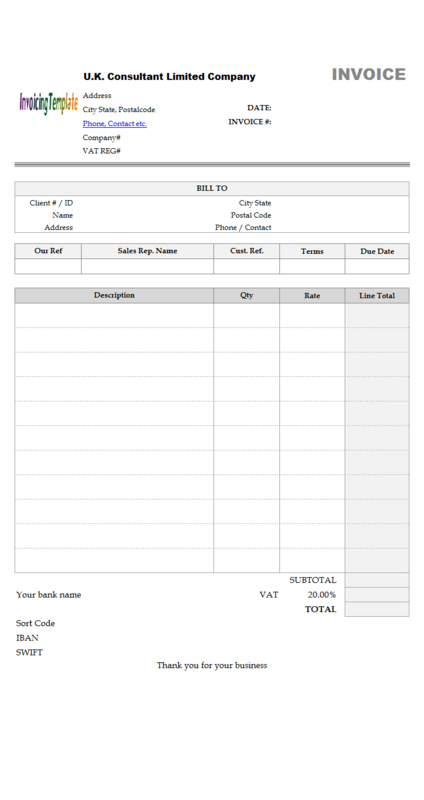 Fill in the taxing options you want to apply to this template, and then click "Apply". You need to save this template (either ".xlsx" or ".xls") to make the changes persist. This template was originally published on uniformsoft.com with template# c5-024. 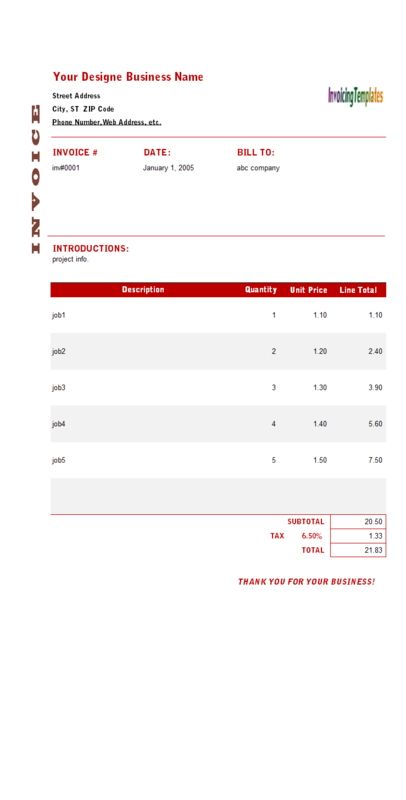 We revisited and moved it here on InvoicingTemplate.com. 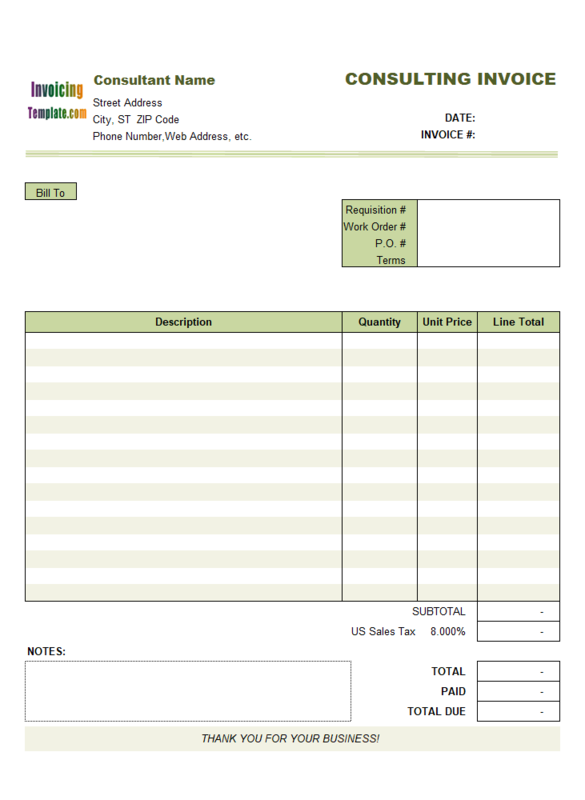 The following description of this template is also a republication from uniformsoft.com. 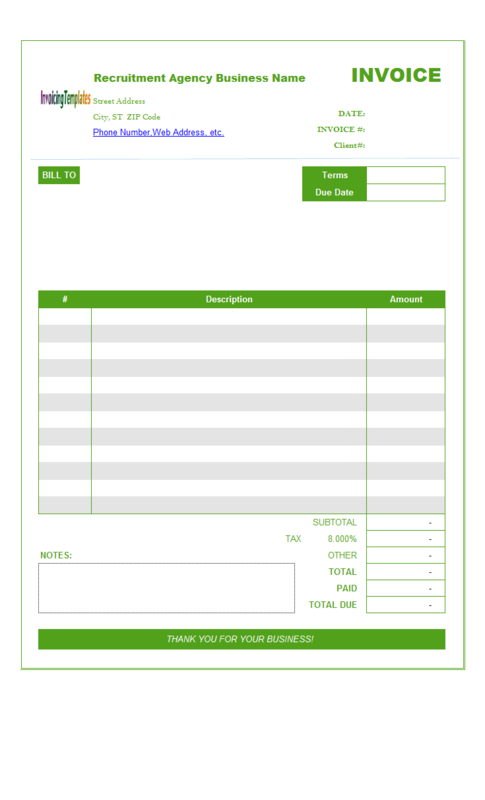 Environmental Consulting Template is an environmental consulting invoice form that helps you bill your clients with an easy-to-use blank bill form in a what-you-see-is-what-you-get invoice creator. 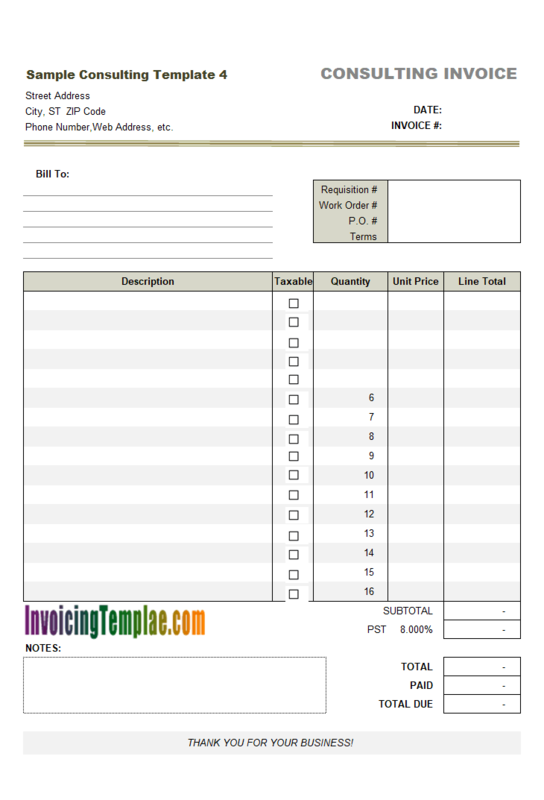 The Excel-formatted service invoice template has 5 columns and offers no shipping section. 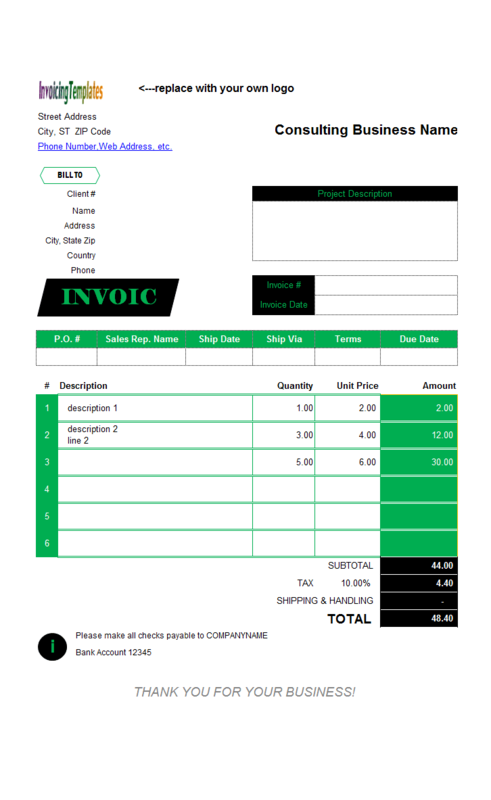 If you have an environmental consulting firm that provides comprehensive regulatory and technical consulting services to municipalities, private industry, and government agencies, this consulting service invoice template designed by Uniform Software might be ideal for you. The service provided by the sample company in this template focuses on groundwater and surface water characterization, impact assessments, compliance monitoring, and permitting approvals (e.g. Permits to Take Water under the Ontario Water Resources Act), and specializes in aggregate resource investigations and provides scientifically defensible solutions to complex hydro geological issues. 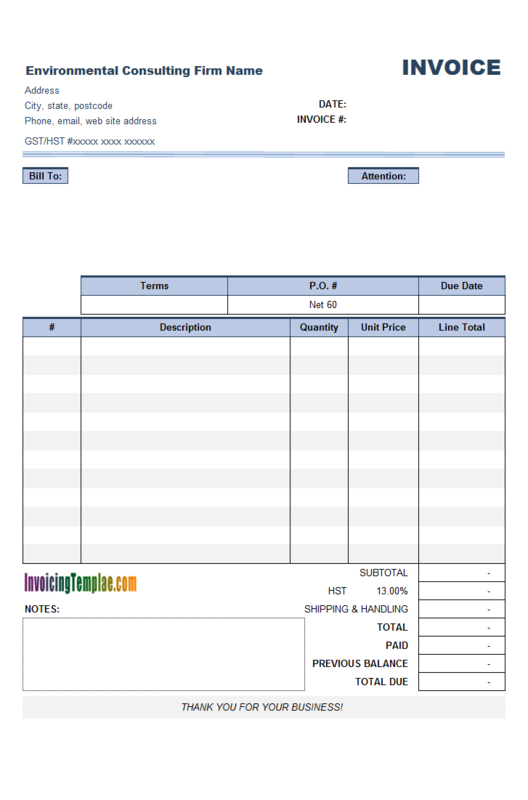 Since this is a service invoice template, there is no shipping address section provided. The space left for shipping address is now labeled with ' Attention'. The template has 5 columns. The first column is labeled with '#'. 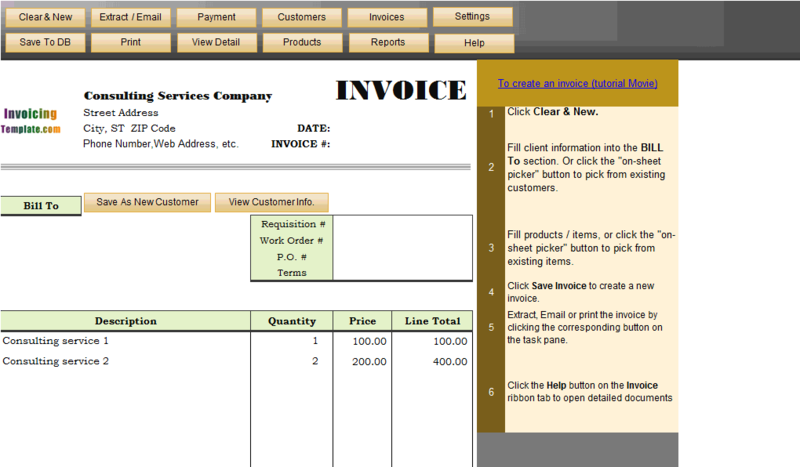 If our Excel-based invoicing program is installed and you open the Invoice Manager for Excel (namely Uniform Invoice Software) version of this invoice template, you can type in a service # right into the cells on this column to retrieve service descriptions and prices from the backend databases. If you use custom fields, additional information saved with your service items can be retrieved in this way too. This feature is called in-cell lookup, which enables you to easily fill the invoicing items and avoiding to type in repeated information again and again. If you cannot remember item numbers, which is required when you use in-cell lookup, you can click the icon buttons on the item lines to choose items from a list that is populated automatically from your database. 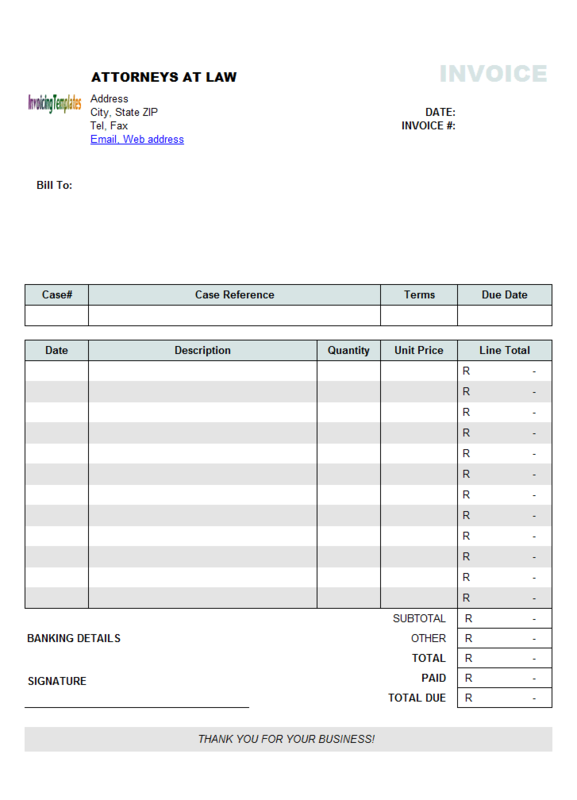 Like other form designs here on InvoicingTemplate.com, Environmental Consulting Billing Form is free (offered to you at a price of 0.00USD). It works on Windows XP and all newer versions of Windows, and Excel 2007, 2010, 2013 or 2016.